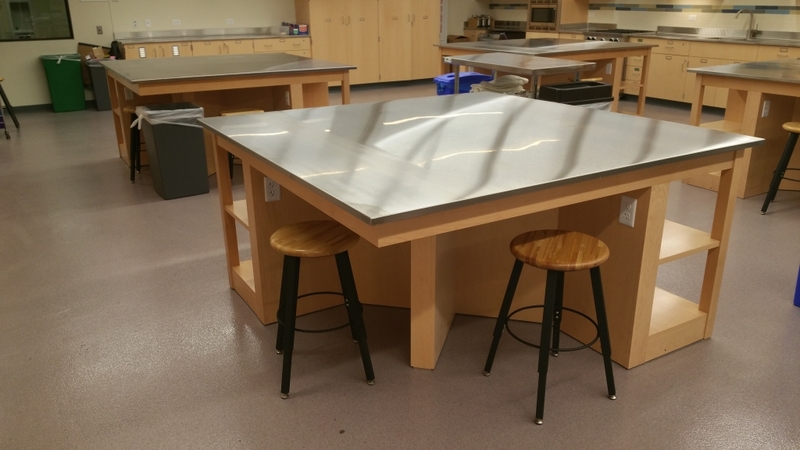 Scott Laboratory Solutions offers custom laboratory table design and fabrication, ranging from standard stainless steel tops to sterile composite materials. We can also create laboratory tables which have access to pre-installed tabletop plumbing and gas fixtures. We also offer electrical wiring built in to the table. This allows for large, separate workstations for your employees or students. Scott Labs’ tables are some of the highest quality tables available, perfect for chemical labs and science labs. Made of durable material, our laboratory tables can withstand years of continual use. When designing custom table solutions, we take care to assess the size and layout of the laboratory. This allows us to create a space which utilizes every available inch. Our laboratory tables are highly functional. We offer options for full-length drawers, cabinets and built-ins for most every application, whether it be a large chemical laboratory or smaller science lab classroom. We take pride in our attention to detail and make sure that each one of our laboratory tables are built to last. We also offer modular laboratory table solutions, including movable tables with casters or rubber wheels. This is a great way to maximize your work space while not sacrificing functionality.